Cal Worthington: A 9th grade dropout who built a car sales empire. Cal Worthington sold an estimated one million vehicles in his 67 year automobile career. In the process he became an American icon for his colorful TV ads which blanketed the airways. Cal was famous for his "My Dog Spot" commercials, a funny knockoff of Southern California car dealers, who used cute dogs in their ads. 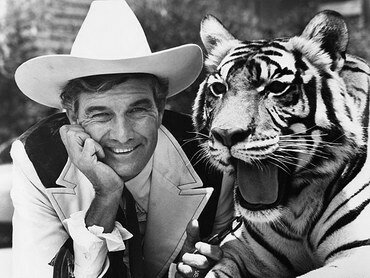 Cal Worthington and his dog "Spot"
Instead of having a dog, Cal had an elephant, or a gorilla, or a hippo among the many "dogs" he called "Spot." These antics sold cars and made Cal a rich and funny folk hero, but his own story is far more compelling. Cal was born on Nov. 27, 1920 in rural Oklahoma, the seventh of nine children. Their home had no plumbing or running water and their clothes were made from old flour sacks. "We were starving and barefooted," Cal told The Los Angeles Times in 2010. "I had a very awful childhood." His father moved the family to Texas so he could work in the oil fields. But the Great Depression hit and Cal had to drop out of school at 13 to help support his family. During World War ll, in 1942 Cal joined the Army Air Corps and became a decorated pilot, rising to the rank of Captain. But after the war, his lack of formal education stopped him from attaining his dream, becoming an airline pilot. Instead, Cal sold his car and used the money to buy a gas station in Corpus Christi, Texas. But the gas station failed. However, while owning that station, he began buying and selling used cars there and discovered he was good at it. In 1948 he moved to the U.S. car capitol, Los Angeles and over many years, built his car sales empire, becoming very successful. But then hard times struck Cal. When the 1970's gas shortages hit, car sales collapsed and Cal with his huge overhead was greatly overextended. Suddenly he risked losing everything. Among the many steps Cal took in desperatation to meet his overhead, he piloted a helicopter over rush hour traffic, transmitting live traffic reports to radio stations. Cal persevered, and when the U.S. economy grew stronger in the 1980's, his sales skyrocketed to $200 million to $300 million each year, and Cal moved his headquarters from Long Beach to his 24,000 acre Big W Ranch near Sacramento, California. He ran his auto empire from the Big W Ranch until his passing at the age of 92 on September 8, 2013. At its peak, this empire had 29 dealerships and at Cal's passing, it still had five dealerships, including his giant flagship Ford dealership, in Long Beach. Cal is survived by his six children and nine grandchildren. He is survived as well by the millions of families that bought vehicles from him and by all the people he employed. But most of all he is survived by the many millions of us who can still picture his ads in our mind's eye, and hear the endless variations of "Go See Cal." Success Tip of the Week:	"I don't do anything very well," Cal told The Los Angeles Times. "I just stick at it." This is a great lesson in perseverance. Editor's Note: To see a funny 3 minute 19 second clip of Cal's ads http://www.youtube.com/watch?v=QOsLdT4slsk Thank you to my friend Ben Haney for sharing this clip.